Americans spent more than $69 billion on their pets in 2017. Is your farm & feed operation getting its share of these growing sales? Most farm & feed stores sell pet products—but most of them can do much, much more to improve their sales in this VERY profitable market segment. After all, most farm & feed customers own at least one pet—so every farm & feed store stands to gain from offering a larger variety of popular pet products and becoming a one-stop-shop for all animal needs. Pet products generate excellent revenues per square foot and ensure a strong, year-round revenue stream—and SuperZoo makes sure your stores cash in on the many opportunities in this booming market. SuperZoo brings together over 1,000 manufacturers and suppliers from around the country so you can shop and compare the huge array of pet products and supplies currently available—and many that haven’t even hit the market yet. 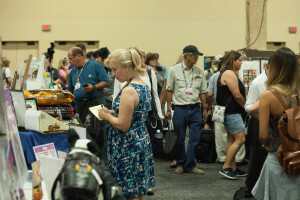 If you’ve never been to SuperZoo, you’re missing out on adding lots of profitable items to your merchandise mix—products you won’t find anywhere else. And if you have attended, then you know firsthand how SuperZoo helps farm & feed stores ring up more sales! Tap into the profitable world of pet retail by stocking the high-demand, high-margin products that pet owners are clamoring for—attend SuperZoo, June 18 – 20 at the Mandalay Bay in Las Vegas. I’M READY TO EXPAND MY PET PRODUCT SALES. ZOOM IN ON THE COUNTRY’S LEADING PET PRODUCTS. Get a complete view of all of the latest trends and popular items in the pet industry—and make sure your farm & feed stores are stocking all of the products that pet owners want to buy. MEET TOP MANUFACTURERS AND NICHE SUPPLIERS. Hundreds of leading vendors come to SuperZoo to display their best products, and they’re ready to partner with you to grow your sales. There’s nothing like meeting face-to-face to build solid business relationships—plus, when you’re here, you’ll get access to exclusive show-only discounts! FOCUS ON IMPROVING YOUR BUSINESS SKILLS. Having trouble breaking into new markets or using social media effectively? SuperZoo’s comprehensive education program offers expert sessions in retail management, marketing and merchandising to help you run a smarter, more profitable operation. See the full education program here. JOIN THESE MAJOR FARM & FEED RETAILERS THAT ATTEND SUPERZOO EVERY YEAR. Successful farm & feed companies already know there’s only one place that supplies EVERY pet product they need: SuperZoo! Follow their example and you’ll be well on your way to more sales—and more profits in the coming year. Artificial Grass of So. Cal.